Making the perfect cup of honey-sweetened tea requires a little more than tossing a tea bag into a mug of hot water. Preparing the right items to make a cup of perfect tea adds to the relaxing ritual of tea making. The reward for your work will be a tasty cup of hot tea sweetened with just the right amount of honey. Add a scone or cookie and you have a nice afternoon treat. Tea bags can be used, but aren't recommended; loose tea lets you enjoy the fullness of the tea leaves and also create a deeper taste. Bring water to a rolling boil in a kettle. For a great cup of tea, use fresh, filtered water. If you are using white tea or green tea, avoid bringing the water to a full boil, or this will "cook" the delicate tea leaves. Warm up the teapot with hot water from the faucet to prepare it for the boiling water. This is advised because the boiling water could crack your teapot—warming it first prevents this from happening. Use loose tea leaves instead of a tea bag. The finer the tea, the better it will taste. Purchase specialty tea at supermarkets or natural food shops. The standard ratio is one rounded teaspoon of tea leaves to every six ounces of water. Measure out the tea leaves and put them into your teapot. If you don't have a strainer to pour the leaves into, or don't want to use one, you can purchase a tea infuser. Pour the boiling water from the kettle into the teapot. Steep your tea depending on your own personal taste and what type of tea you are using. Black tea should be steeped for three to five minutes, green tea should steep for about two to four, and oolong tea for about five to seven. Oversteeping tea could leave you with a bitter-tasting tea, so set a timer to guarantee you'll have perfectly steeped tea. Pour tea into a mug through a strainer, or remove the tea infuser from the teapot and pour. 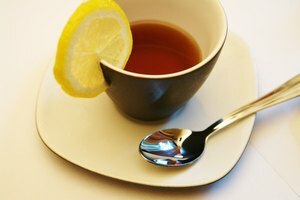 Sweeten your tea with one to two tablespoons of honey and stir. Place a tea cozy on your teapot to keep it warm if it will be sitting for a period of time.